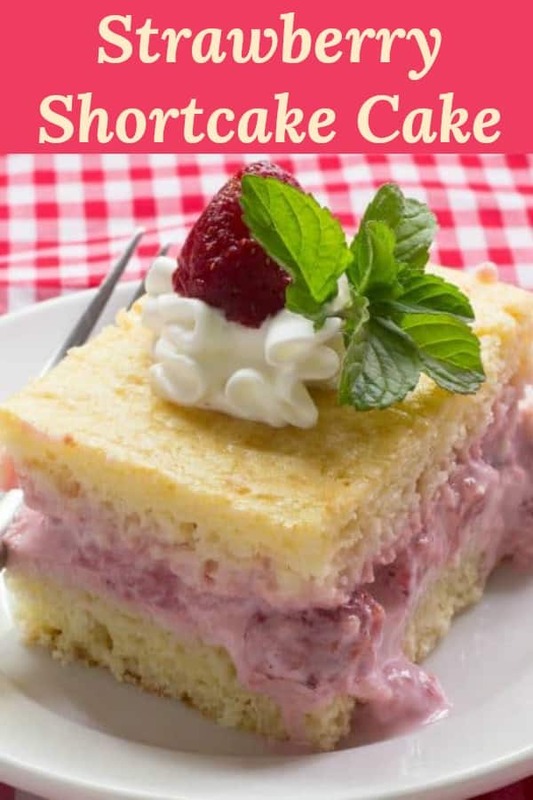 Recipe for Strawberry Shortcake Cake is easy to make and serve to a crowd of people. Macerated strawberries are mixed with half and half before being added to the middle of a layered shortcake. This recipe for Strawberry Shortcake Cake has been handed down from my grandmother. Her’s always tasted the best because she made it with fresh strawberries she picked that morning from her strawberry patch. The best part of their garden was the strawberries they would grow. I could never eat the fresh ones since I would break out into hives whenever I tried to eat them, any strawberry really. But once they had been macerated or frozen I could eat them. Lucky for me, their freezer was always full of frozen strawberries. My favorite way to eat fresh strawberries to this day is in my Grandma Grace’s strawberry shortcake cake. Forget the fact I really can’t eat them fresh. 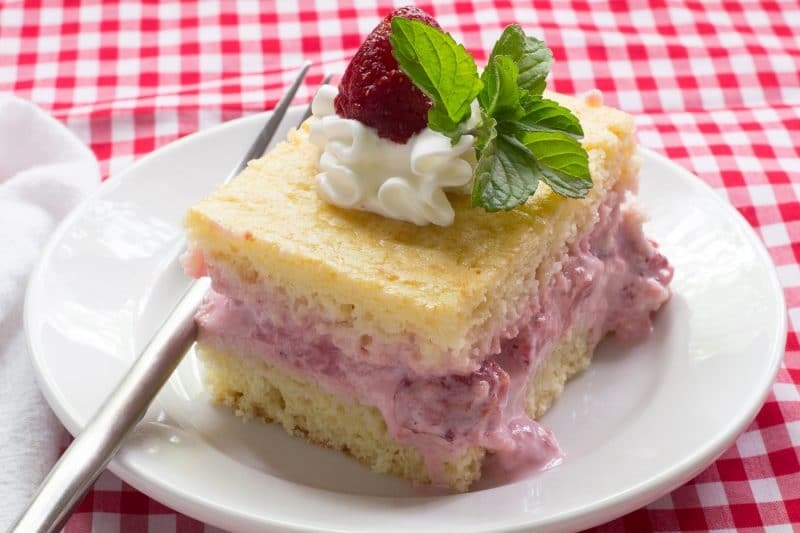 I don’t know why my grandma made her strawberry shortcake this way, and I have never seen a recipe that mixes in the whipping cream with the berries instead of whipping it up for the top. I suspect that somewhere along the way a step was left out of a copied recipe during one generation or another. It doesn’t matter to me how it happened, this is the only thing I consider to be real strawberry shortcake. Everything else is some kind of biscuit covered in strawberries. Not judging though, my family has been known to bake up a can of biscuits and cover them in macerated strawberries and call it good. We have even used our homemade buttermilk sugar biscuit recipe to hold up this filling. Just forget the whole cake part and pour your pink strawberry cream sauce right on top of the biscuits. No half and half? No problem. Use heavy cream mixed with some milk. If you happen to find a great deal on strawberries somewhere, go ahead and macerate up the whole bunch. 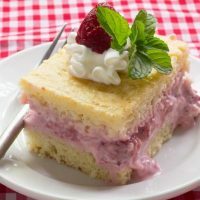 Add half and half as needed for strawberry shortcake cake and use the rest of the strawberries and syrup in strawberry shakes, poured over some ice cream, or use it with sweet chips instead of fruit salsa. Make sure the cake is completely cooled before cutting. Use a long serrated knife, like a bread knife. Starting at a corner, use long sawing motions, as if you were slicing bread. Work your way around the cake and keep the knife as level as possible. Before attempting to lift off the top piece, make sure the center has been cut all the way through. This cake will become soggy on the bottom if you cut it too thin, so do your best to cut right down the center. I have to tell you, that even if you don’t get it cut just right, it will still taste fantastic! Allow this cake to rest in the refrigerator at least 4 hours. Overnight would be better. It gives the filling a chance to soak into the top half of that cake. If you cut it before then, some of the filling will run out. If that happens, remove as much of the spilled filling as possible to prevent the excess liquid from soaking into the bottom half of the cake in the area you just cut. 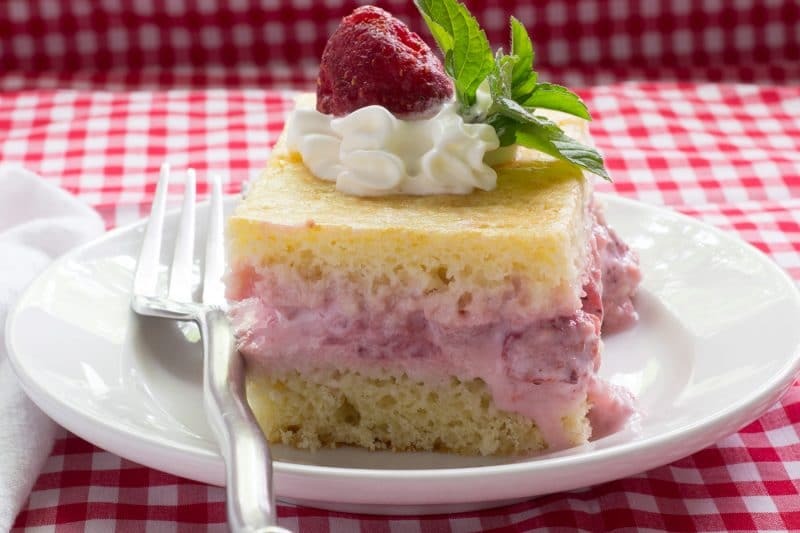 Strawberry Shortcake Cake is best-served ice cold. Stored covered in the refrigerator. Can be stored in a cold cooler for one afternoon. This will last in the refrigerator for about 4 days before the bottom becomes too wet to serve in a square. Unusual recipe for a unique spin on strawberry shortcake. Spray an 9 X 13 square cake pan with cooking spray. Mix all cake ingredients until combined. Do not over mix. Pour into prepared baking pan. Bake in 350° oven for 20 to 30 minutes or until a toothpick inserted in the center comes out clean. While cake is baking, clean and stem strawberries. Slice strawberries into pieces. Put into a bowl and lightly mash with a potato masher or use your hands to squish them up. Add sugar and macerate strawberries until you are ready to assemble the cake. Let cake cool completely. Once cool, remove cake from pan, slice it in half, with a top piece and a bottom piece. Put the bottom piece back into the pan. Mix macerated strawberries with pint of half and half. Pour mixture of the bottom of the cake that you have put back in the pan. Top with the other half of the cake, cut side towards the berry mix and browned side up. Refrigerate at least 4 hours. Serve with whipped cream on top if you like. 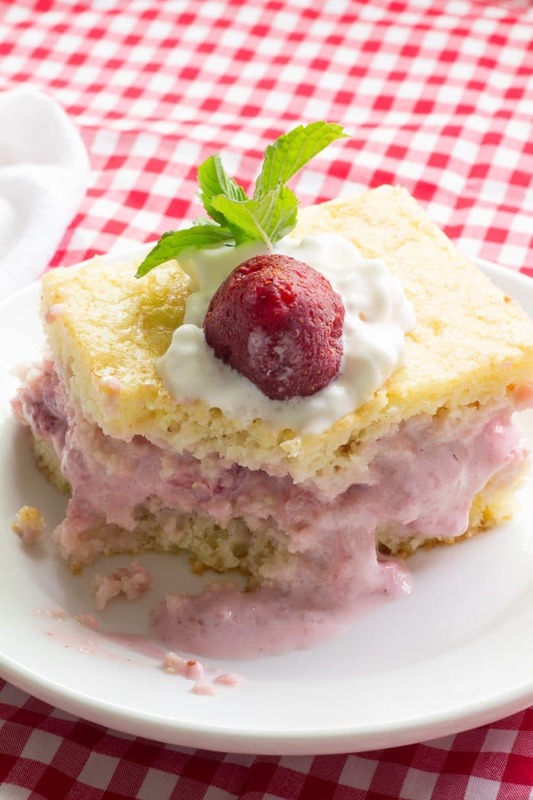 If you are not in a baking mood you can always use frozen pound cake thawed and sliced in place of the shortcake. This version needs to be covered with stabilized whipped cream or non-dairy topping.